716,000 foods in the United States, Canada, United Kingdom and Australia. Verified foods only, user-contributed foods are excluded. 1,300 restaurants among 2,200 vendors including well-known brands, restaurants, fast food chains, supermarkets, special diets, ethnic foods and common USDA foods. See our vendor list. 364,000 UPC barcodes assigned to majority of popular packaged foods. Food popularity rank based on usage in our community of 9 million people. We know what people actually eat. Up to 36 nutrients per food, on average 15 nutrients per food. Up to 10 servings per food. We fight duplicates and normalize the data. Food icons for most foods help you create beautiful, readable food lists. Enjoy our Instant Food Search, find any food and experience the API. Scan barcodes with our free mobile apps. Download Data and API Specification for details or simply check our Food Samples. 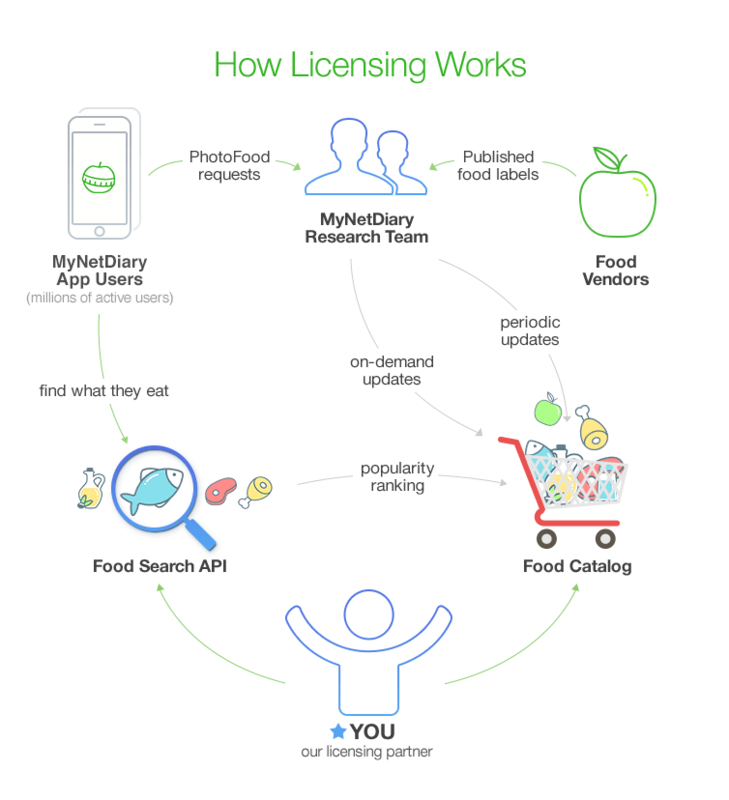 You can license MyNetDiary food database for commercial and research purposes. The license does not allow reselling the data. We offer food database license for $35,000 USD without time limitations. The license includes 3 quarterly updates during the first year of licensing. After that, you can keep using the database indefinitely without further updates. If you would like to keep refreshing the database, we provide additional quarterly updates for $7,000 USD per year. The first year of API usage is free of charge for customers who paid the licensing fees. The second and subsequent years of API usage cost $7,000 USD per year, which makes MyNetDiary the lowest-cost provider of high-volume food search. Deliver your application faster by reusing our search algorithms and servers. Build a quick proof-of-concept, lower initial investment and reduce your app's time-to-market. Our smart and fast API searches by multiple words, partial words and phonetic similarity. Brand names and food categories are searched along with food names. Search results highlight matched user inputs. UPC lookup is included. Search results are ranked by popularity among 9 million diet app users. Unlike other DB providers, we actually know what people eat and suggest the most relevant foods. All food updates are immediately available to your application. We add and verify about 300 foods every day. Obtain complete food catalog and switch to your own search at any time. Service uptime is 99.9% or better. Server response in < 200 ms plus network. Why Choose MyNetDiary Food Database? Our food catalog lists over 716,000 foods. It's much bigger than other popular verified databases, such as CalorieKing and ESHA. Your can keep MyNetDiary data and use it indefinitely after paying the licensing fee. Most competitors charge annual fee. Many databases have obsolete nutrition data. Our continuous food research and popularity ranking helps us keep the database up-to-date. We add or update hundreds of foods each day. We research foods on demand for users sending PhotoFood requests via mobile app. None of our competitors provides such a service, which helps us stay current and quickly add the latest packaged foods to the catalog. Unlike competitors, we fight duplicates and research multiple servings per food whenever possible. Their food databases often count servings as additional foods, having for example dozens of Coca-Cola "foods". Our hierarchical food catalog is convenient for browsing big vendors like Wegmans or Tesco. Competitors' catalogs are usually flat, making it difficult to browse and find foods. Check out the MyNetDiary research system and see how much attention we give to completeness and correctness of the data, and how many data rules are implemented by our research team. We automate data validation as much as possible, but it still takes a human to ensure quality. Every change is double-checked by our quality assurance team. Keeping the catalog up-to-date is challenging since the food industry is a dynamic, ever-changing world: food vendors sell and buy brands, change their name while growing the business, change servings and clarify their nutrition labels over time. We meet these challenge with continuous monitoring and periodic, prioritized verification of such vendors and brands. PhotoFood requests are processed within 24 hours or faster. We add hundreds of foods every day while removing obsolete or duplicated foods. It's a live catalog. It is hard to avoid duplication because of re-packaging and re-branding of the same products and their slight variations. We remove any duplicates within 24 hours after noticing. We work with restaurants and food companies to add and update their menus and products in our food database. If you represent a restaurant or a food company, please e-mail info@mynetdiary.com to get your products included. Other data sources include the USDA Standard Reference database and data from literature sources. Please send your requests and questions to MyNetDiary Customer Support at support@mynetdiary.com.